A Japan Air Self-Defense Force E-767 Airborne Warning and Control System aircraft taxis before takeoff on Joint Base Elmendorf-Richardson, Alaska, Aug. 14, 2015. JASDF AWACS will get upgrades following the Air Force Life Cycle Management Center award of $208 million in February 2018 to the Boeing Co. for installation and checkout of the system. Japan Air Self-Defense Force AWACS will get upgrades following the Air Force Life Cycle Management Center award of $208 million to Boeing for installation and checkout. 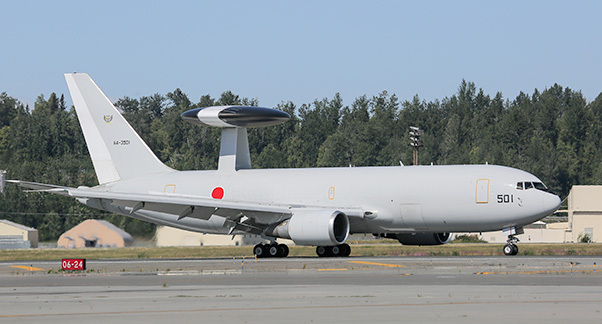 Mission computing upgrades will give Japanese AWACS better interoperability with U.S. systems and improve their standalone command and control capability. AFLCMC’s International Airborne Battle Management Command and Control Division at Hanscom Air Force Base, Mass., which awarded the contract, expects the first delivery in late 2019. The Boeing Defense, Space & Security segment in Oklahoma City is the prime contractor for this upgrade of E-767 Airborne Warning and Control System aircraft and ground support facilities for the Japanese military. This contract, officially awarded Feb. 12, 2018, includes the installation and checkout of enhanced mission computing capability, electronic support measures, traffic alert and collision avoidance system, next-generation identification friend or foe interrogator and data link upgrades for the Japanese AWACS fleet. This new award follows a 2015 contract award to Boeing for the development and production of the MCU capability, which led to this sole source contract. The contract also provides spare and repair parts, personnel training and training equipment, publications and technical documentation, U.S. government and contractor engineering and technical support, installation and checkout and other related elements of program support. “This whole team is very passionate about getting our close allies these capabilities,” said Conrad.